Summary of today’s show: The Fellowship of Catholic University Students sends post-college volunteer missionaries out to college campuses around the country to meet young people where they’re at, to make friends and form relationships, and to lead them in discipleship for a lifelong mature faith in Christ. Scot Landry and Fr. 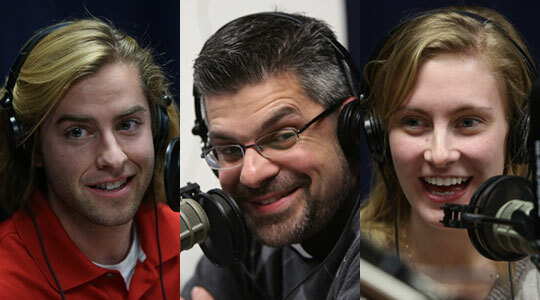 Matt Williams are joined by Levi Rash and Emily Cook to talk about their ministry at Boston University, their journeys from their midwestern homes to Boston, and the extensive training they receive from FOCUS to become missionaries of the New Evangelization. 1st segment: Scot Landry welcomed everyone to the show and welcomed Fr. Matt Williams to the show. Fr. Matt talked about his Christmas and New Year. On New Year’s Eve they were at St. Leonard’s in the North End for Adoration and Mass with Cardinal Seán. On this past Sunday night, he was at St. John’s in Canton for a gathering with Confirmation students. Scot noted that earlier today Fr. Mark O’Connell celebrated a funeral Mass for his father who died last week. He said Mr. Thomas O’Connell was a university librarian and was a wonderful Catholic family man. Scot added that funeral liturgies are among the most beautiful liturgies, especially when the congregation prays for the deceased. 2nd segment: Scot and Fr. Matt welcome Levi Rash and Emily Cook. Levi grew up in Missouri. He went to St. Shelbina in northeast Missouri. Shelbina is a very small farming community of about 1,700. He attended University of Missouri in Kansas City and he faced some of the biggest decisions and challenges in his life. He was fortunate to have FOCUS on campus there. Mass was important to him, but he didn’t know why. And so when he got to campus, one of the FOCUS missionaries spotted him and connected him to the group. In his freshman year he got an invitation to a Bible study and that was the one thing he could do and that was all it took. He later attended a FOCUS conference in Orlando and was challenged to go deeper as a disciple of Christ. Scot explained that FOCUS is an abbreviation for Fellowship of Catholic University Students. Emily grew up in Nebraska and when she got to college, she was looking forward to all that freedom. Luckily, she was immediately surrounded by a Catholic community. For the first few years she attended Mass and lived a surface-level faith, but in her junior year she began to question what she wanted after college. She had been pre-med, but she found it felt empty and so she devoted time to think about why God created her. After that, she met a new FOCUS missionary on campus and that brought her deeper in discipleship. LEvi and Emily talked about creating friendships with FOCUS missionaries who were near them in age. Fr. Matt asked if the strategy of FOCUS is to create relationships with everyone. How do they maintain that many relationships? Levi said they strive to meet students where they are at. They know they can’t stretch themselves thin, despite being available. They follow the plan of working in large group settings and small group settings, but also try to find a handful of four to five young men and women in an intentional discipleship relationship, which is the model of Christ and his apostles. Emily said everyone knows who they are as FOCUS missionaries, but at the same time they are low-key in their approach. It’s about having a relationship, not selling a product to them. Scot said he’s been moved by how much emphasis that FOCUS puts on relationship skill-building. He noted that not only is it the job of missionaries to do that difficult task of evangelizing one-on-one, they have to do their own fundraising to pay their way. Levi said as well as being one of the most challenging things he’s done, it’s also been the most rewarding. By the having conversations with so many people in his life asking for their support, he’s built the relationships he’s had throughout his life into a deeper and greater relationship. Emily talked about the people who were difficult to approach to ask for their support. She had approached a Lutheran family she knew and they grilled her on the Catholic faith. Then a couple days later they called back and told her they would support her in her mission. They told her that they’d never met a Catholic alive in their faith like her. 3rd segment: Scot said he wishes every Catholic could go through the training FOCUS missionaries receive on how to share their faith and answer common objections. Emily said they spent five weeks this past summer at the University of Illinois in Champaign. First and second year missionaries attend and their 3rd and 4th year missionaries come to visit. Emily said she enjoyed Jeff Cavins’ course on the Bible, which basically taught them them Bible in a week. It helped them to synthesize the same stories they heard growing up. Levi said he took a class with Dr. Edward Sri on Scripture and it was quite phenomenal. Scot and Fr. Matt recommended his books very highly. Fr. Matt asked about the importance of Scripture in their work as FOCUS missionaries. Levi said reading Scripture every day is what will bring about the new springtime of faith. To recognize our role in salvation history, we have to recognize it. Emily said anytime we approach the Bible we want to know what God wants to say to me, so they share with college students how to pray with the Bible and to hear God through the Scripture. Scot said there are good videos on FOCUS’s website at FOCUSequip. He asked what they experience as missionaries that help them deal with rejection. Levi said you have to turn to God first and allow yourself to be humbled. They learn it a lot at summer training. The teams also come up with particular strategies for their campus. Praying for and with students becomes very individual as well. Emily said the idea is to continue to build relationships with someone, continue to make your faith attractive, and be available for their questions. When the person is won over to Christ, you’ve extended the message of Christ and they accepted it, then you build it with them in their life. Levi said they look for students who are faithful, available, contagious, and teachable. They are people who can be influencers. Of course, you can’t rule out anyone that the Holy Spirit might call. FOCUS discipleship is a committed relationship. It’s not just hanging out, but diving into the resources of the faith so they can start making changes in their lives. Emily said one of the challenges is finding the balance between being stretched to reach students and keeping themselves grounded, developing themselves and friendships outside of FOCUS. Emily said FOCUS works best in a relational standpoint, so they put themselves in students’ lives by joining clubs, intramural teams, craft nights, book clubs, so that you are human and you are enjoying what they are enjoying and win them over slowly. For others who don’t have their training, he recommends people look at the relationships around them now and ask how to go deeper. Look at your family and your co-workers. Look at your parish. FOCUS is starting to see the effects of missionaries and disciples in their parishes. Emily said the BU Catholic Center is a warm and welcoming place to invite students to and to invite them to be part of a community. She said FOCUS often has a connection to Catholic centers on the campuses they serve at. Levi talked about the difference between his year last year at MIT and this year BU and how they have to be adaptable. Emily said as a missionary they have some input on where they go, it’s mainly up to the FOCUS organization and they leave it all in God’s hands. Levi said they just came back from Orlando, Florida, where they spent the past week with 6,000 students from all over the US at a conference. Emily added that if there aren’t FOCUS missionaries on your campus, they have just launched the Digital Campus, which allows students to be led as disciples remotely. She wins the book Daily Reflection by Diane L. Allen.